» Rocks Don’t Weigh as Much When Submerged Underwater! The day is just beginning–you and Carl are in the dredge hole. Carl is on the nozzle, and it is your turn to heave cobbles and boulders downstream and out of the hole. Next hour, you will manage the nozzle while Carl gets to bust his back on boulders. Throughout the day, you will swap around like this. Except when you have to shut down; because it takes two to winch-out a three-footer like the one just upstream that is sitting right inside of the pay-streak. Winching is slow and dangerous work because of rigging, fast water and other challenges which must be overcome. By now, you and Carl know a lot about boulders and cobbles, in the water or out. Your experience is practical–learned the hard way. But maybe it would help to know, say within ten percent, what a boulder weighs in the water and out. So let’s look at a formula to calculate the weight of rocks in and out of water, by rock diameter. You can easily estimate diameter underwater using hand-spans. You already know that a boulder you can lift underwater just buckles your knees when you try to lift it above the surface. So how much weight is added by lifting it clear of the water? This matters when you are winching, too. We can figure out rock weights both in and out of the water using a concept called Specific Gravity. We don’t have to weigh the rocks in the air and then in the water. But you could check our results if you want to. Plenty of work has been done on rocks and weights, so we will use existing tables and equations rather than re-invent the wheel. Or, we say that gold is 19.3 times heavier than water. Water is our standard, and the SG of water is 1. Now we find from a geology handbook that the SG of most rocks runs from sedimentary (sandstone) (where SG = 2.50); then granite (where SG = 2.73); to basalt (where SG = 3.00). These are typical rocks which you handle all the time while dredging. Since most rocks end up with SG a little greater than granite, it is reasonable to use the .66 or 2/3 ratio as a general rule. That generally means that Ww = 2/3 Wa. 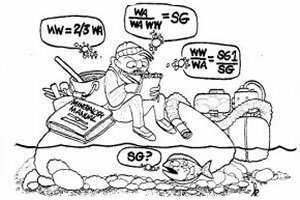 If Wa is a 10-pound rock above the water, it should weigh around 6.6 pounds when submerged underwater. If Wa is a 300-pound boulder, it will weigh about 200 pounds underwater. Looking at it another way, it is the water which supports one-third of the rock’s weight. Going back to the knee-buckling maneuver; when you try to lift that 100-pound submerged rock out of the water, it suddenly weighs 150 pounds. Knees buckle! Your winch has the same problem. Bad back and all, you now have a handy 2/3 rule of thumb! Let’s go a step further and put together a Table of Average Rock Weights submerged and above the water. For simplicity, we will assume all boulders are river-worn to round-shaped objects (spherical). This way, we can list them by diameter in inches. That will be close enough. You can estimate rock-diameter underwater by hand-spans; that is, from tip of thumb to tip of little finger with your fingers spread. Yours will be around 8 or 9 inches; very easy to check with a ruler. So a rock which is about 15-inches in diameter will weigh about 113 pounds submerged and 172 pounds above the water’s surface. About the best you can with a rock this size is roll it around underwater. It will take you and Carl both to roll it out of the hole, and a winch to get it out of the water. That 10-footer in the bottom of your dredge hole is a pretty serious boulder–30 tons in the water, and 45 tons at the surface! This next hour, Carl is going to be heaving rocks and you will be on the suction nozzle. But before you two get back in the hole, let’s consider if there might be a way to improve the efficiency of rock-removal. Especially on rocks that are too big to roll out of your dredge hole. Can it be done by a single person? The marine salvage people use inflatable air bags to lift loads. Bags are lowered deflated. Then they are connected to a basket-load from a single-point suspension, like a pelican hook. This allows for a quick-disconnect. The bag is inflated with compressed air, just enough to lift the load. A tether guides the load’s rise. There must be an air-bleed to prevent too-rapid ascent. What happens when the air bag reaches the surface and loses lift? This would be a major problem in a shallow river with a swift current. If the air bag can be kept underwater while helping to move rocks out of a dredge excavation, it might work. For example, A15-inch diameter air bag should lift about 60 pounds when it is fully submerged. Well, I guess you guys (and gals) are ready to get back to that pay-streak under all those rocks. Oh yes, if you and Carl think this specific gravity business is piddling, consider this: The difference between the SG of magma (2.74), and the SG of country rock (2.97), is enough to produce a volcano. With a few additional facts like the depth of the magma, as determined by seismic readings, the resulting height of the volcano can be reasonably estimated. Now that’s a very big deal!